Green + purple + gold = yes. 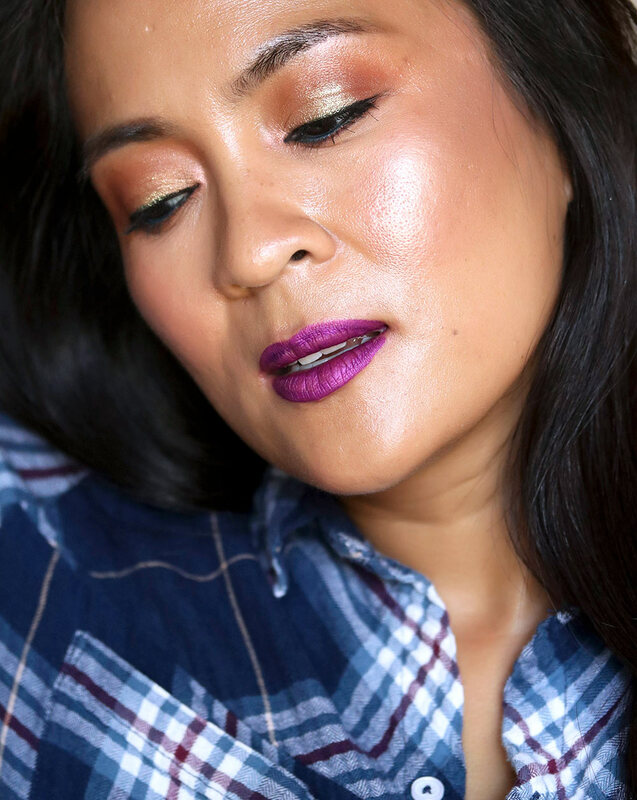 Note to self: Remember this jewel-toned combo, because it totally works with warm orange-brown shadows (I’m wearing the Urban Decay Born to Run palette, by the way). I played with shimmery green liner, purple metallic lips, and gold glitter on the lids here because I really wanted to “go for it” and do more of a LEWK, but if I were to translate this into something I’d wear to, say, the mothers club potluck I went to last night (side note: The Trader Joe’s Salted Caramel Brownies were a success), then I’d swap the metallic lipstick for a sheer purple gloss, line just my upper lash line with the green (so no water lines), and do a tiny dot of the glitter in the inner corners. If ya wanna recreate this look, I also used MAC Retro Matte Liquid Lip Colour in Atomized on my lips, rimmed my eyes with Urban Decay 24/7 Glide-On Pencil in Overdrive, and dabbed Urban Decay Moondust Eyeshadow in Stargazer in the center of my lids. Previous Post: Quick Makeup Query: I Feel Naked Without [FILL IN THE BLANK]? Next Post: Do You Ever Feel Silly/Out of Touch/Old When You Wear Bright or Colorful Eye Makeup? Your skin really looks amazing, I could have sworn there was no product on it. Wow, your skin does look AMAZING. I’m loving the whole look. Are you using the liquid concealer as a base all over or only on spots? I’d be interested in hearing more about how you did your skin. Thanks, lady! Let’s see… I started off with the Charlotte Tilbury Hollywood Flawless Filter Customizable Complexion Booster, which is more like a very sheer skin tint (so not a lot of coverage). Dotted a little bit ion my cheeks, forehead, chin, then buffed it in with a Real Techniques buffing brush. Gave it about 5 minutes to set and dry. Then I dotted the shade #9 of the liquid concealer onto my cheeks and around the base of my nose, which are the areas I like to have more coverage on (I purposefully leave the bridge of my nose bare so the freckles can peek through; I think strategically leaving areas of skin exposed helps when you’re wearing base makeup, but trying to look like you’re not wearing it), blended that in with the same Buffing Brush. Let that set for a few minutes, then I dusted the powder all over my face with a big fluffy brush. I tried to use as little as possible to avoid a “powdery” look. Let me know if you have any more questions about the products. I think they’re fabulous! Oh you are inspiring me today! Your skin is amazing!! And I never thought to do a purple tone lip with the green/gold eyes so gorgeous! Especially with your jewel toned plaid shirt, I want that shirt! I wanted to get her Magic Powder, does it work like Laura Mercier setting powder or like Hourglass? New to the setting powder scene, I’ve been using only finishing powder for years. What’s different in how the two perform? It depends on the brand, because some lines use the term setting powder and finishing powder interchangeably. But generally setting powder refers to the powder you use right after foundation to lock it down and keep it from moving. Finishing powders are kinda like a fun bonus. They’re intended to be used on top of setting powder for a hyper-perfected look, although I know many people use them to just set their foundation. You’re welcome, Jade. Feel free to ask any more questions if you have them. Happy to help! Yeah, it’s in the same category as those powders. 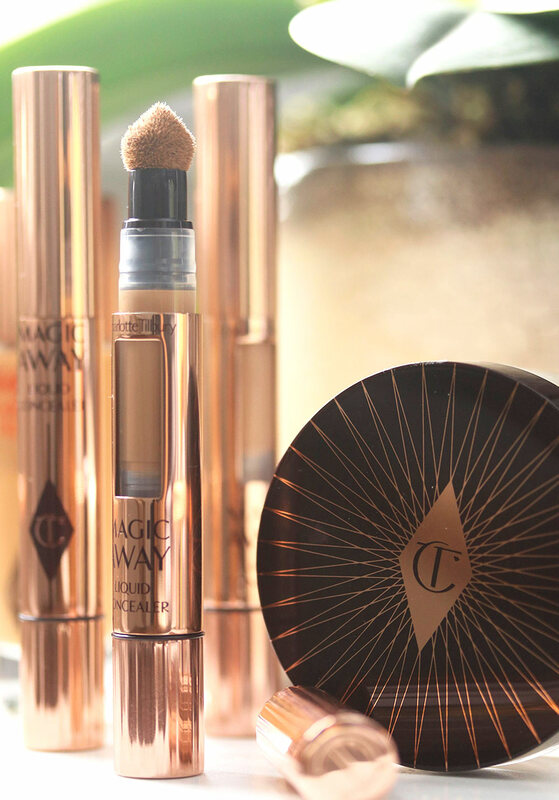 Magic Powder sets foundation and concealer, mattes down the skin, diffuses the appearance of pores, and it also adds a very subtle radiance to the skin (it’s not shimmery, by any means, but it does add a little something something). I think what makes it different is that it’s much finer; I rarely like to wear powder underneath my eyes because everything looks cake-y, but this didn’t. I’ve been wondering if the Charlotte Tilbury makeup lived up to the hype. (I kind of thought it might.) Love this look so much!! I finally nailed the purple smoky eye this week and now you’ve inspired me to throw just the teeniest smidge of that green UD eyeliner up in the mix. Do you know, I had not tried anything pumpkin spice until last night? It just didn’t seem like it would taste good. 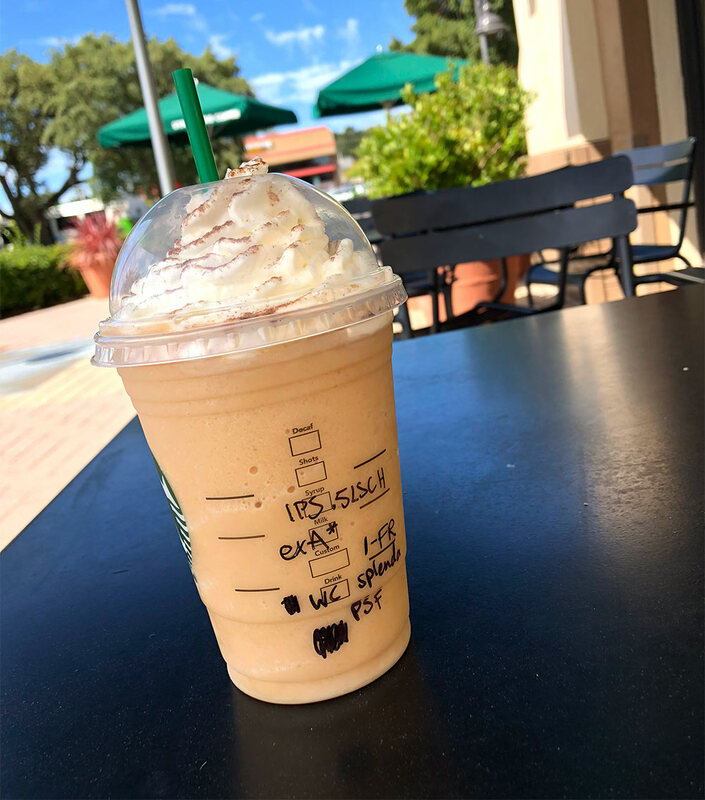 But Little Bit got an iced pumpkin spice frap and gave me a taste. It was actually delicious, so I guess I’ve joined the cult now. And yay, glad to hear you are on Team #PSL! The original is always good, but so are these other versions I’ve been trying. P.S. RE: Charlotte Tilbury. I may or may not have just put a few things in my Sephora cart!!! Love the look! And I love purple lips. Awesome. I tried the recipe you provided for Pumpkin Spice yesterday. Although I changed it to an americano misto (I don’t drink cold coffee personally). It was so good!! I loved it. Although I did one pump of pumpkin and one pump of vanilla (I don’t like it too sweet). Thanks for the tip! It’s my new go to. ?? Beautiful look! Your skin looks magnificent. I’ve heard CT’s powder is really good. It’s exceptional! Very fine and you can’t even tell that it’s on. Anywho, I struggle with powders as I wear bronzer and never want to look too “powdery”…would one apply this powder and then bronzer, blush, or the other way? and what about highlighter? So many products I’ve used over the years but NEVER mastered setting/finishing powder. I would typically do powder, bronzer, blush and highlighter. But ultimately, for me, it really depends on the finish of the product. If I know the highlighter has a lot of shine, then sometimes I’ll layer it underneath a 50/50 mix of bronzer and blush. Totally understand not wanting to look too powdery. Have you ever tried MAC Fix+ Spray? It really helps with that issue.